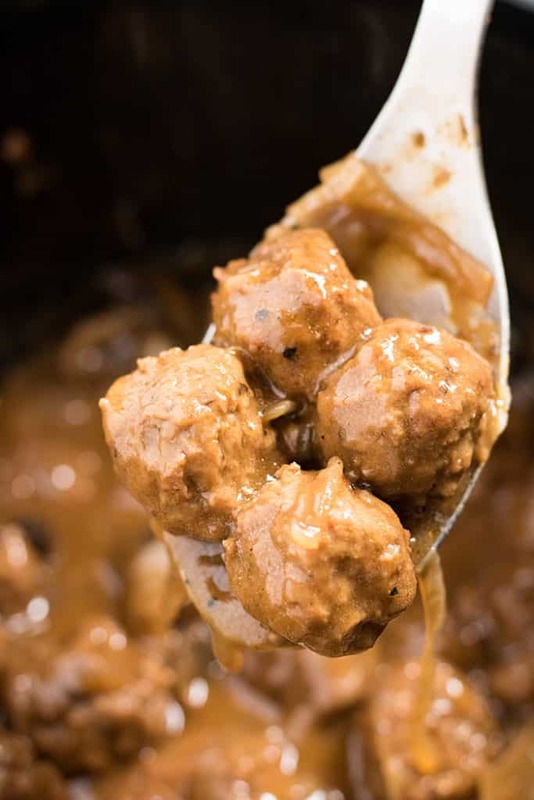 Slow Cooker Meatballs and Gravy – An easy slow cooker or Crockpot recipe for tender and juicy meatballs cooked in a deliciously hearty brown gravy! 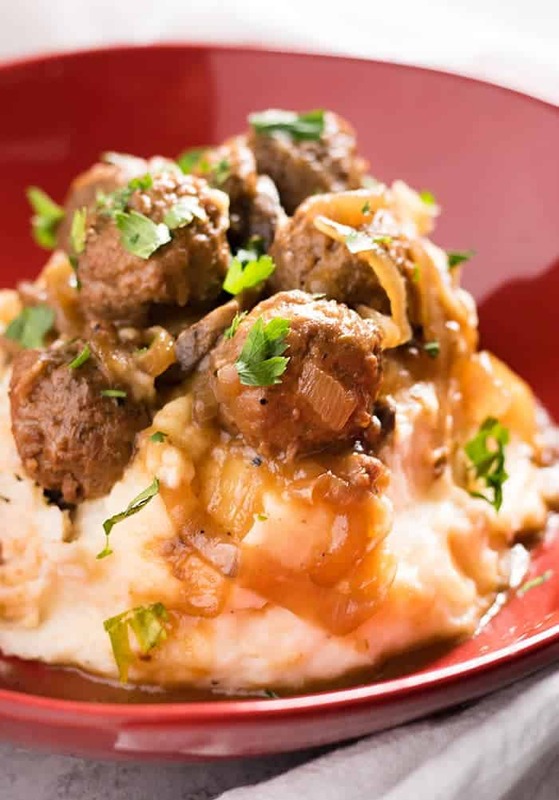 The best meatballs and gravy are amazing served over mashed potatoes, pasta, or all by themselves! You guys. I know I just posted a meatball recipe last week, but, those Grape Jelly Meatballs are completely different than these “Salisbury steak style” meatballs! I mean, those CAN be a meal, but they’re more of an appetizer. But THESE, beefy gravy meatballs are absolutely a meal. 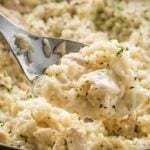 A hearty, family approved, lick the bowl clean, meal! So, forgive me for doing two meatball recipes two weeks in a row?? You will when you have a big giant bite of meatball in your mouth. Promise. So, these have become a new family favorite. Guaranteed they will be a regular on our dinner menu from now on. I’m more inclined to eat things like this in the Fall and Winter. 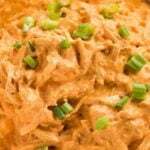 BUT, if you’ve had my Crockpot Frito Pie or Crockpot Bourbon Pulled Pork, then you know I’m perfectly fine yanking out my slow cooker even if it’s the middle of summer and somewhere between 100 – ten trillion degrees outside. What I’m saying is, it’s impossible to not want to slurp up this brown gravy with a spoon. And the meatballs are sooooo tender, they just melt in your mouth. 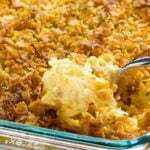 Don’t plan on having leftovers! Now, if you want, you can make your own meatballs for this recipe. I like to use frozen meatballs to save myself some time/headache/extra dishes. My grocery store carries three kinds of frozen meatballs: Italian style, Swedish style, and Beef. I went with beef and they always turn out great, but I definitely think any would work. Whichever meatballs you try – just make sure you serve these up on top of my Cream Cheese Mashed Potatoes! Those are homemade – absolutely no instant mashed potatoes here, ever. Slow Cooker Meatballs and Gravy - An easy slow cooker or Crockpot recipe for tender and juicy meatballs cooked in a deliciously hearty brown gravy! 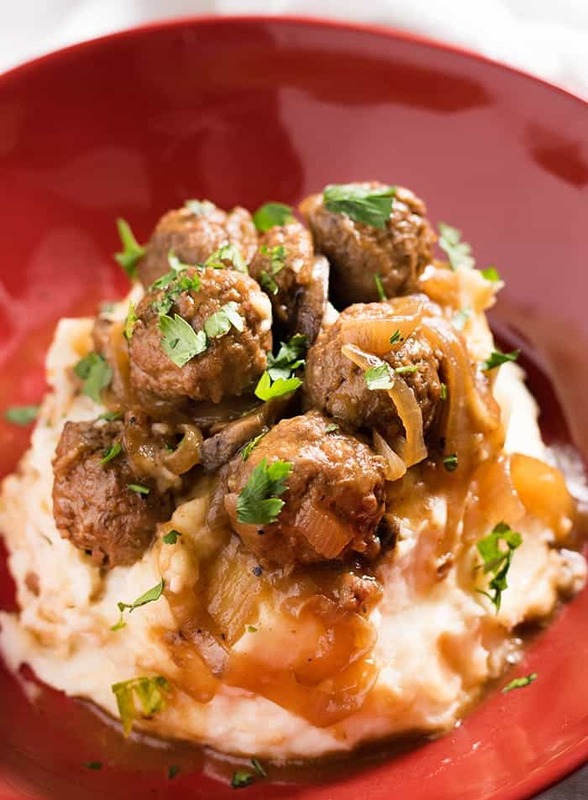 The best meatballs and gravy are amazing served over mashed potatoes, pasta, or all by themselves! 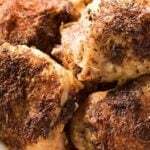 1/2 Teaspoon EACH Garlic Powder, Onion Powder, Salt, Pepper. Place the frozen meatballs, sliced onion, and mushrooms in the bottom of your slow cooker. Set aside. 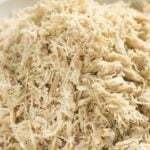 In a medium bowl whisk together the beef broth, gravy mix, worcestershire sauce, ketchup, and seasonings. Pour mixture over meatballs. Cook on low for 6-8 hours, or on high for 3-4 hours. Once cooked, remove the meatballs from the slow cooker and set aside. 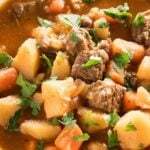 At this point if your slow cooker was on low, turn it up to high. Mix together the cold water and cornstarch in a small bowl. Whisk the cornstarch mixture into the broth for 1-2 minutes until thickened. Return the meatballs to the slow cooker and stir gently to coat with gravy. Serve immediately. Crockpot Meatballs and gravy: These salisbury steak style meatballs are super easy to make for a weeknight family dinner! 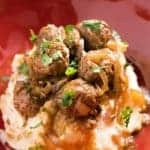 The best recipe for tender meatballs cooked in brown gravy right in the Crockpot or Slow cooker, and delicious served over mashed potatoes! Made this this weekend and it was delicious! I was out of Ketchup so I used a tbsp of tomato paste instead! Other than that I followed the recipe. Hi, I am dairy free for my breastfeeding baby. Can this be made without the gravy packet and substitute something else, since all of the gravy packets I’ve found have dairy in them? Hi There! 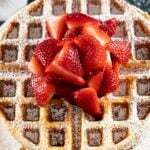 Can you make this using an Instant Pot? I made these today and they were a BIG hit!!!!! I will certainly be making these again! This is delish, and will make it more often. My crockpot recently died and I haven’t purchased another one yet. I was wondering if this could be cooked without using the crockpot and just on a stovetop? What brand of meatballs do you recommend? Two questions…if I’m not using frozen meatballs do you think I should reduce the time? Also one package of meatballs I have are Italian style with mozzarella cheese inside. Do you think these would work for the recipe? Do you think these could be made ahead of time? I suppose the better question is at what point would it be best to freeze? Hi, Larissa! You can make these meatballs ahead. Make the full recipe as directed, then allow them to cool before freezing. You can put them in raw!